Imagine your home is bombed one Sunday afternoon by a horde of enemy planes. Imagine your family has gone and you are left behind. This is the fate of five-year-old Peter and teenagers Yuri and Tanya. Imagine being ordered to leave school to fight the terrifying Nazis in World War II. Imagine you are right in the middle of a battle; it’s you or them – you have no choice. This is the fate of Vlad and his three classmates. Nobody has managed to stop the triumphant Nazi invasion across Europe. It all depends on one city – Stalingrad – her citizens, her soldiers - and her children. 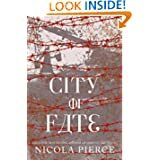 The battle of Stalingrad is the setting for this Children's/ YA novel by Irish author, Nicola Pierce. We have all read the familiar accounts of children's experiences in WW2 but these stories tend to based around Germany and the Nazis. This book looks at the effects of war on the children and families of Russia. Peter is found wandering the streets, orphaned and afraid. Yuri has lost his family also, and takes Peter under his wing. They spend their time hiding from the Germans and searching for food.